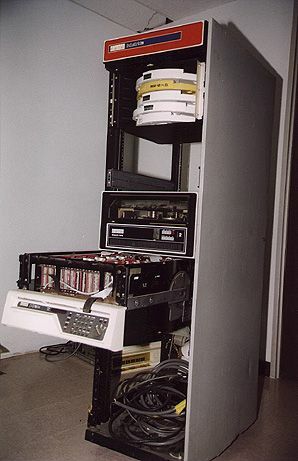 History : 02/13/98 : Acquired 6' rack, RK05J drive, 5 RK05 disc packs and the 11/34 for $100.00. 02/21/98 : Verified power supply was good and powered on for the first time. It works! I don't have much experience with DEC equipment so I'm having fun learning about this system. I'm just beginning to restore this machine to operation. 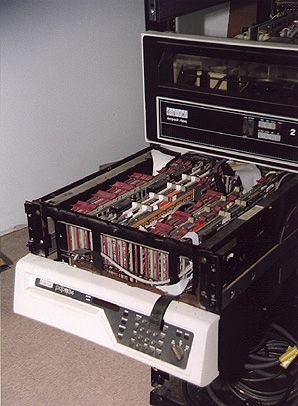 If you have any documentation, I have none, or info or items for the PDP-11 series, let me know. I can also use any assistance, info or whatever in bringing this back online. The boards with the system are: RK05 controller (M7254, M7255, M7256, M7257), memory (H-228B, H-222A (x2)), memory parity (M7850), SLU & Realtime clock (M7856 (x2)), an M7814, console interface (M7859), boot roms (M9301YF), and cpu (M8265, M8266). The RK05 drive seems to be missing a cover. Any one have a spare around? I'd hate to have dust get in and mess with the heads.